“He was a real kid once, just like any of us” begins the supernatural legend of the Pricker Boy; the son of a fur trapper hardened by lies and taunts transformed into a creature with a protective skin of thorns who haunts the woods. The Pricker Boy is a campfire favorite amongst Stuck Cumberland and his childhood friends who meet each Summer until a mysterious package containing mementos of their youth challenges their belief. Slowly, the truth begins to reveals itself hiding just beyond the Widow’s Stone, prickling the bond of friendship and trust. 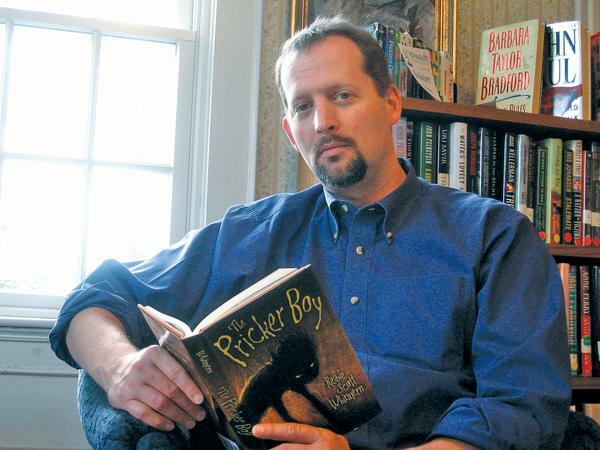 Reade Scott Whinnem is the author of The Pricker Boy; a paranormal fable that both plunges into the depth of darkness at the edges of reality and captures the darkness of human depth. 1) Was there a “Pricker Boy” story that you grew up with during your own childhood? No, but we did have the story of old Carob Astor; a murderous hermit who lived in a house in the woods out by the reservoir. He grew crazier as he got older, eventually becoming nocturnal and wandering around town looking into people’s houses while they slept. Eventually, he started mangling people and the police had to hunt him down and kill him. But evil like that couldn’t die, of course. I’d tell the tale and then we’d head out into the woods in the dark to see his house. It was a ridiculous story but what a great scare. My early encounter with the Pricker Boy came in the form of a nightmare that I had when I was extremely young. In my nightmare, a boy whose entire body was covered with thorns lived in the bushes near my grandparents’ house. I could see him from the edge of the yard as he tried to crawl out and grab me. I knew he was going to drag me under the thorns but I was too scared to move. I woke up screaming. I was about seven or eight. Now, over thirty years later, I get to bring him to life for everyone to enjoy! 2) What stories (or movies) and legends scare you now? I’m not scared by much but then again, I refuse to watch a lot of modern horror. Many modern horror movies just try to make people feel uncomfortable by showing torture and mutilation. As I said earlier, I was writing that kind of thing when I was a teenager. Doing that is a lot easier than writing a good, spooky ghost story. I can’t remember the last movie that really scared me. I go back to the classics; all the way back to the original Frankenstein, Dracula, and the Wolfman. I’m not going to say that they’re still scary after all these years but they have great atmosphere and emotion. The only writer who really frightens me is H. P. Lovecraft, and that’s because he leaves so much of his work open for the imagination to play on. Right now, I’m reading Ancient Images; my first Ramsey Campbell novel which has great atmosphere. 3) What do you think are key ingredients for good horror and suspense? The scariest real life stories are the ones that defy explanation and I mean unexplained phenomena as well as unexplained human behavior. Too many stories, especially movies, try to tie off all the loose ends and explain everything away. Take Jack the Ripper, for instance. That case still fascinates people today because it wasn’t solved and because his behavior was so bizarre. People have theories as to who he was and why the murders stopped but no one will ever know for sure. Sadly, when it comes to horror, too many writers create wonderful atmosphere only to have the story climax with a chase scene and a gun fight. Fred and Velma pull the rubber mask off the monster and then explain away all the tricks he was able to perform. Perhaps there’s a cheesy wink to suggest that the monster isn’t really gone but usually everything gets packed away nice and neat. I think that good horror isn’t afraid to leave the door cracked just a bit. I didn’t try to explain away every little thing in The Pricker Boy but I did try to satisfy the reader. The few things that aren’t explained in the end are hinted at and left up to the reader’s informed judgment. I hope that because of this, the story will stick with people for a while after the last page is read. 4) What sort of comments have you received from both adults and young adults who have read The Pricker Boy? I tried as much as possible to avoid indicators of time in my writing, so my characters don’t spend much of their time texting, emailing, and playing video games during the course of the book. Because technology plays no significant role in the story, my adult readers have been able place the time period of the book during their own adolescence, which has made for a nostalgic ride for them. Consequently, the story seems to work for adolescents and senior citizens alike. I like the fact that the book is accessible across age groups. So far, the response has been great. Several people have told me that they had to turn on a few extra lights in the house as they got towards the end, which is very gratifying. One adult friend, who isn’t familiar with YA fiction, said that she was surprised by how frightened and how moved she was by the story. She’d thought, ‘It’s a book for kids, so how bad can it be?’ She said that when she finished chapter four, she knew she was in for a bumpier ride than she’d anticipated. She got scared by the scary bits and she cried at the sad bits. I suppose it’s odd to say that I want my readers to get scared and to cry but I really do. I want them to be moved by the story and the early buzz is that they are. 5) If you travelled back in time, what is one thing that your present self you would tell your former self? When I was in graduate school I had a friend (we’ll call him Clyde) who every once in a while would get a bit weepy and start calling friends up and telling them why he liked them so much. One night he called me. I’d given him some of the screenplays that I’d been working on and he wanted to tell me how much he liked my writing. He told me that he saw me writing novels one day. I said that I didn’t think I was a disciplined enough writer to pull something like that off, and that even if I could write one, the chances that it would be publishable were slim to none. He said I was wrong. Here we are almost fifteen years later and it turns out Clyde was right. So I think that given the opportunity, I’d head back and tell my younger self that given time, I was capable of a great deal more than I thought I was. But since I can’t do that, I’ll pass it along to your readers. Chances are you’re capable of a lot more than you think you are. Given time and steady work, you’d be amazed at what you can create. 6) What is your approach to writing? It’s tough to balance because I teach full time, which is why I do most of my writing during the summer. I find that the only way I can get a manuscript done is to get up early and work every day. I start at page one and work all the way through. I keep ideas on scraps of paper and tack them to a corkboard that I’ve divided up into sections by chapter. When I’m ready, I pull down all the notes, organize them as much as necessary, and write the chapter. 7) What advice would you give writers trying to publish their work? Be stubborn, develop a thick skin, and learn the etiquette of the publishing world. There’s usually going to be a lot of rejection before your work gets accepted. There are a lot of people pounding on the doors of the publication houses because they’re convinced they’ve written something remarkable. Maybe they have and maybe they haven’t. But the point is that there is a lot of shouting going on and that’s going to make it difficult for the editors and agents to hear you sing. A little thing like learning how to write a proper query letter, doing research through some of the Writers’ Digest books, and targeting your submissions to specific people goes a long way. It takes time and patience. It has taken me years. But I love it enough that I’m willing to keep hacking away at it. So keep writing, keep writing, keep writing. Thank you to Reade for kindly doing the interview and to Jessica Shoffel of Random House! Excellent! If I could write like this I would be well chuffed. The more I read articles of such quality as this (which is rare), the more I think there might be a future for the Net. Keep it up, as it were.